Govt sowing seeds for another ag-sag? Let’s start with something we can agree on: we all want clean waterways. Where opinion diverges is on how that is to be achieved. Environment Minister David Parker told TVNZ 1’s Q+A programme that in some parts of New Zealand cow numbers may have to be cut. As I have said many times before, the major contributor to problems in the Kakanui River isn’t farming it’s seagulls. CORIN This is a massive signal. This is like your oil and gas. This is you saying to the farming sector, ‘You cannot continue with some of your practices in dairying, and we will force you to have less cows.’ What work have you done to look at what the economic impact of that would be? Because we know if there’s a drought, for example, and milk production goes down a couple of percent, it takes off a percent off GDP. DAVID Mm. Well, I think the Landcorp example is illustrative that it’s not the end of the world for dairying. The Landcorp example is not a good one because the company’s return on capital is abysmal and it’s propensity for making losses couldn’t be sustained by private businesses. CORIN Have you done the work that shows what the economic impact for some, particularly dairying regions, would be? DAVID We haven’t done an analysis of what the economic effects would be. But it’s very, very difficult to model, because second-best from the farmer perspective may still be very close to the same outcome profit-wise. Can I go back to what I was saying that I think one of the answers to this in south Canterbury, for example, lies in land use change towards more cropping, more horticulture, which are high-value land uses. . .
It’s not just difficult to model, it’s ignoring the reality that land, climate and soils that suit dairying don’t necessarily suit horticulture. Replacing dairy with horticulture might have some economic merit, but land suitability has to be considered, as does the supporting infrastructure and inputs. The point about any land-based activity is that it suits the topography and climate, which interact with the parent material to create the soil. Farmers and growers understand the nature of the interaction, and then manage the deficiencies – fertilisers, irrigation, shelters, for instance. They also consider the infrastructure, processors and markets. Land that can be used economically and environmentally sustainably for horticulture has mostly been converted already. There are also detrimental environmental impacts to be considered. Research on the Canterbury Plains reported in the media last year indicated that dairy conversions involving fertiliser and irrigation, actually increased organic matter. The reverse is also true. And when organic matter breaks down, nitrogen is released as is carbon dioxide. Massey University’s professor Tony Parsons has examined the land-use challenge with funding from the New Zealand Agricultural Research Centre (NZAGRC). He has calculated that at a given N input, dairy produces two to three times as much food, similar or less methane and less than half the amount of nitrogen loss. He has also shown the use of supplements improves efficiencies. Combined with strategic use of shelters and feed pads, nitrogen losses can be reduced. . . In recent years, the debates about water rights and water pollution in New Zealand have become increasingly torrid. Most New Zealanders have fixed views on the topic and are confident their views are correct. Human nature then leads to so-called facts being organised to buttress those fixed views. There is a term for this phenomenon called ‘noble cause corruption’. The problem is that ‘we’ have the ‘noble cause’ and ‘they’ have the ‘corruption’. And so, within this framework, the water debate has been characterised by huge superficiality, rhetoric and shouting. The opportunities for shared learning and accommodation have been minimal. . . Radical environmentalists and anti-farming groups have done a very good job with the superficiality, rhetoric and shouting. What we need now is science and the recognition that problems decades in the making will take time to solve and that improving water quality isn’t as simple as reducing cow numbers. Currently, there is great confusion between issues of water quantity and water quality. Dirty dairying has become the catch phrase. At a public level, distinguishing between nitrogen leaching, phosphorus runoff, bacterial loadings and sediment does not occur. There is also very poor understanding as to the constraints to cash crop and horticulture production in the absence of irrigation. The rural community also has to accept that change is necessary. . . The rural community, and farmers in particular have generally not only accepted that change is necessary but have poured money into making changes which enhance and protect waterways. They are aware, as the government and many others don’t appear to be, that water quality isn’t just about the environment, it also has a direct impact on the economy. It is remarkable how huge swathes of the big-city populations have lost sight of the dependence New Zealand has on its natural resource-based industries. They do not appreciate that destruction of agriculture is incompatible with poverty elimination. . . .
Dairying has revived communities that were dying, creating jobs on farms and in businesses which service and supply them. Schools which were in danger of closing have had their rolls boosted, sports clubs which were in decline have been revived. It has also provided a huge boost to the national economy, as the biggest or second biggest export earner and a major contributor to the annual tax-take. The regional slush fund will be no compensation for the destruction of businesses and the people who depend on them. The fund itself will be in danger if the tax take and export income are severely reduced by attacks on farms and farmers. The Lange-Douglas policies created the ag-sag of the 80s. Few would argue with the necessity for change and what that government did but this government ought to have learned from the damage done by how they did it. Farmers aren’t arguing against the need for clean water. We’re just very worried that the government is sowing the seeds for another ag-sag. They, and too many other people, don’t understand the economic and social cost of forcing fast changes, especially where they’re not backed by science. Housing Minister Phil Twyford announced what looked like a big boost to Auckland’s housing supply yesterday. “The previous Government signed off on Unitec’s investment plans to consolidate their campus and develop the spare land for housing. “The plan change has already been through Auckland Council. We know that because various local councillors were opposing the development. “All that has happened here is that a land development that was owned by one part of Government is now owned by another arm of Government. A pure re-badging exercise. “The development at Unitec has already been factored into the plans and predictions for housing development in Auckland. “All that seems to have happened here is that Mr Twyford wants to use taxpayers’ money to subsidise the building and selling of homes that were going to happen anyway. . .
Involving the government is likely to add to costs and delays. It would be far better to leave building to the private sector rather than tying up taxpayers’ money with all the complications that brings. PHIL: So, you’re talking medium-density, as pretty much all the KiwiBuild homes in Auckland are going to be medium-density, apartments, flats and town houses, terraces. 500,000 to 600,000 is the kind of range we’re talking about. CORIN​: So somebody is going to get a $600,000- what, two-bedroom, three-bedroom house in Mt Albert? PHIL​: Yes. Two to three, yes. Cheap? Since when has $600,000 for a two to three bedroom house been cheap?
. . . The Government’s own officials have said that, in Auckland, land use regulation could be responsible for up to 56 per cent, or $530,000, of the cost of an average home. “ACT has revealed from Written Parliamentary Questions that Cabinet hasn’t even decided whether to consider reviewing the Resource Management Act – rules that determine what can be built where – after 150 days in the Beehive. “New Zealand does not have a free market in housing. It is a market created and manipulated by government. “The Government – whether central or local – controls the Resource Management Act, zoning, consents and other factors that influence the market. “Our housing market isn’t a case of market failure but an example of regulatory failure. New Zealand has planning rules which mean that the market is not able to increase the supply of houses in response to increases in demand. . . The RMA and zoning are a big part of the housing cost problem. So too are building regulations. Economies of scale with bigger populations don’t explain all of the difference in the cost of building a house in Australia and New Zealand. If the government is serious about affordable housing it needs to look at building regulations which require more expensive materials on this side of the Tasman than the other.
. . . No, look, you know, if there’s a cost of cleaning up our rivers, cos I think it’s your birthright and mine to be able to swim in our local river in summer, and for our kids to put their head under without getting crook, there’s a cost to that cleanup. As Nick Smith said last week, he thought that the cost for central government was going to be about $100 million per annum. Now, who should pay that? Should we tax pensioners? Or working people? Or should the farmers who are polluting make a contribution? . .
As a general rule, polluters should pay and farmers who pollute now do pay if successfully prosecuted by regional councils. Prosecutions can be not just for actual pollution but also for potential pollution from, for example, effluent spills which could reach waterways, even if they don’t. But problems with waterways aren’t always the result of current practices, they’ve built up over years, even decades. It is unfair to tax all irrigators now for damage done in the past for which many wouldn’t have been responsible. It is equally unfair to tax irrigators who aren’t contributing to pollution to clean up after those who are and to tax those in one area to repair damage done in another. This tax isn’t going to be levied just on polluters it’s going to be levied on all irrigators no matter how good their farming practices and environmental stewardship are.
. . . CORIN Here’s the thing – you’ve targeted farmers. But why are you giving an exemption to Coca Cola and various other businesses in the cities? DAVID Well, what we’ve said is that domestic and stock water will never pay. We’re not interested in the municipal sources of water. You know, Coca Cola, they already pay a dollar per cubic metre or a dollar per thousand litres to the Auckland Council for the water they drew. We’re not going to charge them twice. . .
Good grief! Does he think irrigation water arrives at the farm gate for free? To get water from the North Otago Irrigation Company (NOIC), farmers have to buy shares and pay a cost of about $80 $800 per hectare per year. That covers the infrastructure and delivery costs, which are the same costs Coca Cola pays for council water. If Labour isn’t going to charge Coca Cola twice, why is it going to charge farmers twice? . . .CORIN But it does feel, there will be many in the farming sector who will be frustrated and feel they’re being singled out. DAVID It is them who are polluting our rivers, so I don’t know how that’s unfair. CORIN Well, they’re certainly a contributor. DAVID Well, no. Let’s deal with one of the issues that Steven Joyce said. He said, ‘Look at the cities.’ You know, over the last decade, cities have improved their quality. CORIN But they do pollute waterways as well. DAVID Not nearly as much as they did in recent decades. And who’s paid for the cost of that cleanup? The people in the cities. They’ve paid for better sewerage treatment; the factories have cleaned up. And over those same decades, the rural sector rivers are getting worse. Now, who should pay? Should the polluter pay or should we tax pensioners? . . It doesn’t matter how many times or different ways he says it. Problems have built up over decades and not all are caused by those irrigating now. Most farmers have changed their practices to stop pollution, to repair damage and enhance waterways. Labour’s policy won’t give them any credit for that, will charge all irrigators regardless of whether or not they are causing problems, and will tax farmers in one place to clean up water in another. And not all the problems in rural rivers are caused by irrigation. Other amber readings were recorded in the Taieri River at Outram on December 12 and 19, and in the Taieri River at Waipiata on December 15. Mr MacLean said the Outram spikes were caused by high river flows on December 12 and heavy localised rainfall on December 19, and the Waipiata spike was caused by rising flows at the time of sampling, due to rainfall on December 12. Readings at both sites had since fallen to the green band of fewer than 260 E. coli parts per 100ml of water, which was considered very safe for swimming, Mr MacLean said. . . .
Seagulls and heavy rain, not irrigation, caused spikes in pollution and the poor water quality after the rainfall lasted only a few days. Nature caused that problem and nature fixed it without any political interference or tax. And not all councils have paid for better treatment. The state of the Invercargill City Council’s stormwater system has been called a “dirty little secret” that has been allowed to exist for years. Federated Farmers had a crack at both the city council and Environment Southland about the city’s stormwater system at a resource consent hearing on Thursday. Federated Farmers executive David Rose, at the hearing, said: “It was a revelation to us, this dirty little secret in Invercargill hidden from Invercargill ratepayers, how rundown the stormwater system is”. In the council’s own evidence, it accepts stormwater was contaminated with sewage, Rose said. The council has applied to discharge water and contaminants from stormwater systems into surface water bodies and into open drains, for a term of 35 years. A total of 147 discharge pipes draining to the Waikiwi Stream, Waihopai River, Otepuni Stream, Kingswell Creek and Clifton Channel are covered by the application. But Environment Southland says the consent should be turned down, because receiving waters and the New River Estuary will be effected. Environment Southland principal consents officer Stephen West’s report says, “With the known sewage contamination of the stormwater network, including the engineered overflow points, it is likely that the discharges will have more than minor adverse effect on the environment”. Effects on water quality within the receiving waters and in the New River Estuary appeared to be more than minor, it says. . .
No farm would apply for consent which would allow it to pollute waterways for 35 years. But there’s nothing to be gained by widening the rural-urban divide as Labour is attempting to. We all want clean water. That won’t be achieved by Labour’s policy which will raise issues around Maori ownership of water. The most effective way of improving water quality on or near irrigated farms is for farmers to make changes on-farm and to invest in new technology. Labour’s policy takes money from productive uses like that and channels it through a bureaucracy. In doing so it takes responsibility and accountability away from farmers and worse provides a disincentive for them to make improvements to their practices. “The Labour Party’s glib and misleading announcement this week about a new water tax was disappointing for all New Zealanders,” says IrrigationNZ Chief Executive, Andrew Curtis. “Farmers are clear that a tax on irrigation would affect all New Zealanders through higher food prices but Labour has failed to address this, even though many of their voters cannot afford to pay more for groceries,” he says. “We think the tax is inconsistent in treating water used for irrigation differently to other types of commercial water use and there are a range of complex issues associated with how it would be implemented which appear not to have been thought through at all,” he adds. IrrigationNZ requests that Labour provides written answers to the questions below so that voters can understand the impact of this new tax on all New Zealanders. What is the impact of Labour’s water tax? How much tax will be charged per unit of water? What impact will the tax have on price increases for food eg fruit, vegetables, meat, milk, beer, bread, wine, ice-cream, and how will poorer households afford price increases? How many jobs would be lost across New Zealand due to our food becoming unaffordable at home and not competitive internationally? How will a water tax enable local communities to implement solutions to their environmental issues? How is Labour’s water tax fair? Who will the tax be paid to? Why is it fair to tax some types of commercial water use and not tax others? Exporters already pay income tax – why should they pay twice? Why is Labour not going to introduce a sewage tax in town water supplies when the Our Freshwater 2017Report found that E.coli and nitrate-nitrogen concentrations are highest in urban catchments? How is Labour’s water tax proposal workable? If the tax varies depending on water scarcity, water quality and weather conditions then how many different tax rates will there be? Which organisations have you consulted on the tax? Can Labour confirm that those affected by the tax will set the new tax level as suggested by the Leader? If tax payers have a different view to Labour will the tax payers’ view prevail? How will Labour’s water tax address the impacts of climate change and existing investment? How will taxing water used to grow food increase New Zealand’s resilience to climate change? Over the last 5 years there has been $1.7 billion investment in modern efficient irrigation infrastructure – what impact will the tax have on this? Honest answers to these questions would kill the policy, which is what it deserves for being so inconsistent and unfair. Water quality is an issue all over the country, not just where there’s irrigation and it can be more of an issue when the water falls straight from the sky as rain than when it’s controlled through irrigators. All farmers should, and most do, play an important role in improving the health of waterways. Picking on just some of them with a tax will hinder the good work already being undertaken, provide a disincentive to do more and open a can of worms over water ownership. The chief executive of Landcorp, Steven Carden, on TV One’s Q+A programme says the business is reviewing all land conversions and looking for alternate uses for land that are economically more viable, and environmentally more suitable, than dairy farming. “I think if you look at Landcorp – and we farm throughout the country – we are looking at all of our land portfolio and thinking, “What is the right land use for it?” And I think what we’ve found is that we can’t really find dairying as the justified new additional land-use conversion option,” he told Corin Dann. “So we are looking at alternatives. I think New Zealand can sustain a few more cows, so long as there are the farm systems set up to do that. So people are looking at herd homes and other farm infrastructure which would require us to farm quite differently but allow us to produce more milk. Having said that, that’s not our future, I don’t think, as a primary-sector country, to just produce more of a commodity product like milk, necessarily.” . . The grisly slaughter of a pet dairy cow that was dismembered for meat has left a South Waikato farming couple fearful. Thieves armed with a gun and knives broke into Bev and Trevor Bayly’s 172-hectare farm early one morning and slit the throat of their “friendly” Jersey. When attempts to shoot the cow dead went wrong, the rustlers took to the animal with knives, cutting off the legs before leaving the carcass behind at the property between Wharepapa South and Arohena, near Putaruru. . .
(BusinessDesk) – New Zealand’s Overseas Investment Office has sent its recommendation on a proposal for China’s Shanghai Maling Aquarius to acquire a half stake in Silver Fern Farms, New Zealand’s largest meat processor, to the relevant government ministers for a decision. Land Information Minister Louise Upston and Associate Finance Minister Paula Bennett received the documentation from the Overseas Investment Office last week, and are now considering the application, spokesman Harley Thorpe said. The Ministers are aware of the Sept. 30 deadline Shanghai Maling and Silver Fern Farms had set for the deal and have that in mind, he said. . .
Robots and drones have already started to quietly transform many aspects of agriculture. And now a new report is predicting the agricultural robotics industry, now serving a $3 billion market, will grow to $10 billion by 2022. The report, by IDTechEx Research in Britain, is called Agricultural Robots and Drones 2016-2026: Technologies, Markets, and Players. It analyses how robotic market and technology developments will change agriculture, enabling ultra-precision farming and helping address key global challenges. It describes how robotic technology will enter into different aspects of agriculture, how it will change the way farming is done and transform its value chain, how it becomes the future of agrochemicals business and modifies the way we design agricultural machinery. . . The pilot of a weed-spraying helicopter used his emergency locating beacon to raise the alarm about a seriously injured farm worker in the central North Island. The pilot was about to start his spraying job on a farm near Ohura, west of Taumarunui, on Monday when he noticed a man on the property had apparently fallen from his horse. . . The slime – also known as lake snow – was first found in Lake Wanaka in 2004, and has since been found in Lake Coleridge and Lake Wakatipu. The lake snot has clogged up fishing lines, boat intakes and Wanaka’s laundromats, and has led the Queenstown Lakes District Council to install a filter on the Wanaka town water supply. . .
A primary school north of Auckland has seen its roll surge in recent weeks with the opening of an unusual daycare. Waitoki School near Kaukapakapa has built a daycare pen for lambs and is encouraging its 90 pupils to fill it with their own woolly companions. “We have about seven to nine lambs on site at the moment. The kids bring them along and it’s their job to raise them, look after them and feed them,” said the school’s principal Chris Neison. The lamb daycare was built in mid-August by a team of teachers, parents and grandparents. . .
Scion has been helping with the project by developing vegetative cuttings using leading edge technology that reflects community values. Ngati Whare and Scion are to be congratulated. This shows the acceptable face of Scion’s work and does not involve transgenic organisms or genetic engineering. Scion had earlier success with the propagation of seeds from the rare taonga plant Ngutukākā (white kaka beak), which have been planted on the ancestral lands of Ngāti Kohatu and Ngāti Hinehika. . .
Food Safety and Associate Primary Industries Minister Jo Goodhew will travel to China today for bi-lateral meetings and to open a new Fonterra dairy facility in the Shanxi Province. “The relationship between New Zealand and China has never been stronger, and it is crucial for our economy that we maintain that strong relationship in food safety,” says Mrs Goodhew. While in Beijing, Mrs Goodhew will meet with Vice Minister Teng Jiacai of the China Food and Drug Administration (CFDA) for the third Joint Food Safety Commission meeting, to build upon the shared goal for increased communication and cooperation between the two countries. . .
DairyNZ’s Tactics for Spring events kicked off in the Waikato last week, aimed at helping farmers manage their pasture during the most productive time of the year on-farm. The nationwide events are taking place in September and October, the beginning of the ‘money months’ when more pasture will be grown and more milk produced than any other time of the year. With uncertainty around where milk prices will go DairyNZ research and development general manager Dr David McCall is urging farmers to focus on what they can control. . . The most memorable days end with the dirtiest clothes. (that’s not a job that usually dirties clothes and I’m not sure why he’s using a ladder). After leasing premises at the industrial McNulty Road site for 10 years, the team at Rockburn Wines recently completed their first vintage at their new winery in Ripponvale Road, Cromwell. The award-winning producer acquired the existing winery site in September last year to meet increasing demand and future-proof its operation. “Due to rapid growth and remarkable popularity of our wines, we were forced to outsource some processes in previous years due to capacity shortfalls. We’re very pleased to bring everything back under one roof from this vintage onwards. The old McNulty Road winery was getting near breaking point and we’re thrilled to have found a site at Ripponvale Road that sets us up for further growth,” says Paul Donaghy, General Manager of Rockburn Wines. . .
Duncan Garner chaired last week’s debate between the finance spokespeople for five parties. He began by saying each speaker had three minutes to give a pitch and he’d accept interjections if they were witty. The speakers largely abided by his rules and on the few occasions any tried to speak over another Garner quelled him. On Sunday Corin Dann chaired a debate between Finance Minister Bill English and Labour’s spokesman David Parker. He kept control throughout, only rarely did one of the MPs try to talk over the other and Dann kept good control when that happened. In both debates the audience heard almost every word the speakers said. Contrast that with the Leaders’ Debate between Prime Minister John Key and Labour’s David Cunliffe on Thursday. Mike Hosking rarely seemed to be in control and let Cunliffe away with constant interruptions. The result was he looked like a boor and it was difficult to hear what either he of the PM was saying.
. . . Moderator Mike Hosking could have been more aggressive himself. There had been criticism from Labour over the choice of Hosking to chair the debate. It felt he had pinned his colours to the mast by introducing Key at a business meeting and exhorting those there to vote for him. Perhaps Hosking felt a little hamstrung – if he pulled up Cunliffe too often, the accusations of bias would appear to have some justification. . .
That a debate could have a strong influence on how people vote is concerning. But whether or not it does, it should allow the speakers to speak and the audience to hear what they say and it’s the chair’s role to ensure they do. Not PC has some advice on a proper debate. Garner and Dann showed how to do it. The chairs in the remaining debates should follow their example. 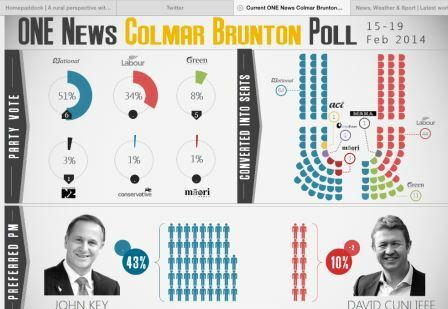 Last night’s One News Colmar Brunton Poll appeared to show National gaining at the Green Party’s expense. The blue vote went up 6 points and the Green one fell 5 while Labour stayed the same. But rather than swapping from green to blue it’s more likely that green went red and pink went blue. Green voters liked Labour’s lurch to the left so moved to the red party but a similar number of voters towards the centre didn’t like the lurch left and moved centre right over to National. That is the conundrum Labour faces – policies which bolster its support from the left lose it support from the centre. The poll follows the trend showing steady support for National and little or no progress for the left. The PM is still popular and Labour leader David Cunliffe is not. Meanwhile National’s election year pitch of boosting teacher performance is proving popular. But the Prime Minister says his party won’t rest on its laurels, or on the tailwind of a booming economy. “It’s a good poll but we need to be cautious,” John Key says. “There will be a lot of polls before the election they will bounce around a lot.” . . The six-point surge in the ONE News Colmar Brunton poll to 51% may well reflect a strong economy and the feel good factor of summer. However, it also must be acknowledged that Prime Minister John Key has made a strong start to the year. His popular education policy sending a clear signal to voters that National is capable of fresh ideas and is not a tired government. Labour leader David Cunliffe meanwhile had his policy launch of a baby bonus derailed by a gaffe and has seemed to struggle for confidence and exposure since. . .
As for the Greens’ big fall in the poll, that is harder to explain. It may be that Russel Norman’s liaisons with Kim Dot Com have hurt the party, or it could also be a reflection of National’s efforts to discredit the party as extremist. It could also be that more exposure for the Greens is showing up flaws in its policies and that its supporters don’t accept the compromises that would be necessary if it was in government.